According to Deputy Economic Development Minister Andrei Klepach last week, Russia's economy shrank by 7 percent year on year in the first quarter of 2009, a staggering turnaround for an economy which has just enjoyed eight years of solid oil-fueled growth. "These figures are worse than we expected," Klepach said at a press conference in Kiev,citing preliminary figures. Klepach also stated that net capital outflows reached $33 billion in the first quarter of 2009, following record outflows of $130 billion in the second half of last year. 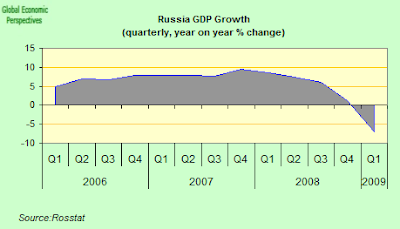 The Russian State Statistics Service have also released official gross domestic product figures for the fourth quarter of 2008. GDP was up 1.2 percent year on year, the worst reading for any quarter since the first quarter of 1999, and down from a revised 6 percent in the previous three months. The World bank are now suggesting that the present slump may be deeper than the one that followed the government debt default and ruble devaluation in 1998. Certainly the data are bleak. Industrial production contracted for a fourth consecutive month in February - falling by 13.2% year on year - as the credit squeeze and falling incomes eroded demand for metals, cars and consumer goods. Retail sales contracted in February for the first time since February 1999. Unemployment was also up, at 8.5 percent in February, the highest level since January 2005. Manufacturing output plunged with the collapse in demand in the last two months of 2008, and it is likely to contract further in 2009. According to Rosstat five of 14 major manufacturing industries reported outright output declines in 2008, with electronics, electrical, and optical equipment hardest hit (-7.9 percent), followed by textile and sewing (-4.5 percent) and by chemicals (-4.2 percent). Most of the dislocation took place in November and December 2008, when total manufacturing output respectively fell 10.3 and 13.2 percent (year-on-year). As credit continues to tighten and demand to fall, manufacturing is likely to contract further in 2009. According to recent statistics, manufacturing output dropped 24.1 percent in January 2009, compared with January 2008, and 18.3 percent in February 2009, compared with February 2008. In February 2009 the most significant declines were registered in the production of electro-technical and optical equipment (-46.6%), other non-metal products (-33.3%), and transport and transportation equipment (-31%). The latest data we have to hand confirm the ongoing character of the contraction. The Russian economy is thought to have declined by 5.4 percent in March compared with March 2008, according to the latest GDP indicator estimate provided by VTB Capital. 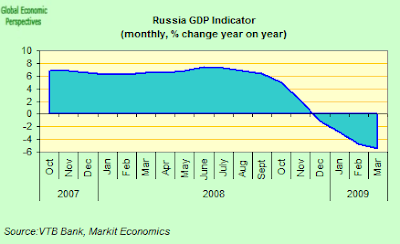 The VTB GDP indicator also registered an average 4.4 percent contraction for the first three months of 2009, which would be the worst decline since the economy shrank 5.1 percent in the fourth quarter of 1998. The difference between the VTB estimate and the 7% estimate put forward by Klepach would lie in the fact that the VTB indicator does not include contstruction, and construction activity has declined sharply in recent months, so the two pieces of data are consistent with one another. Purchasing power has been reduced by lower wages and less access to credit, togther with rising unemployment rates. 6.4 million Russians, or 8.5 percent of the economically active population, were unemployed in February, a 5 percent increase over January and a 20 percent increase on February 2008. The World Bank forecast recently that unemployment would rise to 12% in 2009. The weakening in retail sales and other consumption indicators is not that surprising given the strength of the contraction, and especially since there is now growing evidence that Russia's employers, in order to make cost savings while maintaining staff levels during financial crisis, are more and more resorting to salary reductions or part-time working schedules. This approach is thought to be being used widely and appears to have much more legitimacy under Russian law than simply telling employees to go home and take unpaid leave. Employers are being advised to take special care when unilaterally modifying major terms and conditions in employment contracts, since although under the Labour Code, changing the terms and conditions of an employment contract is permitted only by mutual written agreement of both parties, there is an exemption from this rule – Article 74 of the Code - which specifies that in the event of a change in organizational or technical working conditions which make it impossible for the previously agreed terms of an employment contract to be maintained, an employer is entitled to unilaterally change such terms on his or her own initiative. As a result of this contraction in output and weakening in the labour market real incomes have declined substantially in Russia since the autumn of 2008. Rising unemployment and worsening enterprise finances (wage arrears have increased considerably) have meant that in the fourth quarter of 2008 alone, real disposable income dropped 5.8 percent year on year, and by 10.2 percent in January 2009 (again year-on-year). And unpaid wages as a share of total enterprise turnover tripled to 0.12 percent in December 2008, compared with August 2008. The stock of wage arrears as of March 1, 2009 (8 billion rubles or about USD 240 million) remains small but is likely to increase as the crisis grows. At the present time such arrears are thought to affect up to 450,000 people, significantly less than 1 percent of total employment. Growth in real wages came to a complete halt in January-February 2009, following double-digit increases in previous years. Activity in Russia’s service sector continued to contracted in March, although the seasonally adjusted headline VTB Services Purchasing Managers Index rose to 43.9 in March from 40.0 in February. 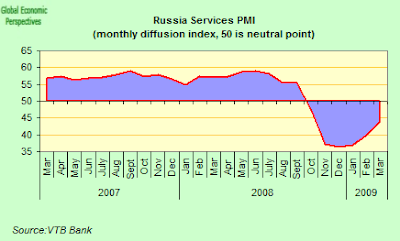 Since any readings below 50.0 signals contraction, we can see that while Russia's services are still contracting, they are contracting somewhat less rapidly than in earlier months. Activity and new business both declined for the sixth consecutive month, however the rate of decline in the volume of new business was at its lowest rate since last October. However a survey-record decline in employment was registered in March, with redundancies at their most severe in hotels and restaurants. Firms raised output prices at a weaker rate in March, as input price inflation moderated and pricing power remained weak due to falling demand for services. “Surging price competition on the back of weak market demand has urged companiesto tighten their cost cutting programs. Among the measures that have been applied are further redundancies that resulted in the fastest rate of employment contraction in the history of the survey. The input price inflation eased slightly, however, the pressure of utilities charges remains significant,” Svetlana Aslanova, an analyst at VTB Capital, commented on the survey. Russian manufacturing contracted at the slowest pace for five months in March as companies reduced their stocks of unsold goods and the decline in new business eased, according to the latest PMI report from VTB Capital. 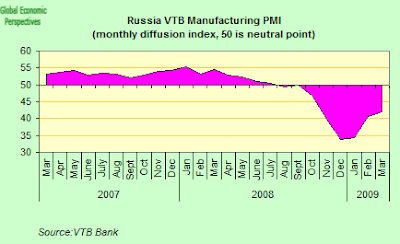 The VTB Purchasing Managers’ Index was at 42 last month after a 40.6 reading in February. Stockpiles of unsold goods fell at the fastest rate since December 2005, according to the survey of 300 purchasing executives. Russia’s inflation rate rose to a five-month high in March as the weaker ruble boosted import prices. The rate rose to 14 percent from 13.9 percent in February, while consumer prices grew 1.3 percent month on month, compared with 1.7 percent in February. Inflation was spurred at the start of the year by the weakening ruble, which pushed up import prices, helping the annual rate jump to 13.9 percent in February from 13.4 the month before. The ruble has now lost 29 percent against the dollar since August. The most recent spike in inflation is evidently producing quite a headache for the Central Bank, since chairman Sergei Ignatiev last week that if April's inflation is “significantly less” than it was a year ago, the central bank may consider cutting interest rates for the first time since 2007, giving some kind of monetary relief to an economy which is badly in need of it. Russia’s inflation rate went as high as 15.1 percent last June, and has since come down somewhat from that peak, but really the record of the central bank in containing inflation has been pretty abysmal. Bank Rossii has been forced to raise its refinancing rate twice since last November, to the current level of 13 percent, in an attempt to limit the amount of rubles available to banks and companies and to slow the decline of the ruble against the dollar. On the other hand the central bank may be in danger of excessive optimism at this point, with Ignatiev telling journalists that his expectation was that the economy may pick up within “several months,” thus trying to offer hope that Russia's banks won’t suffer that “second wave” of crisis that Finance Minister Alexei Kudrin said may hit as bad loans eat up capital. I am of the opinion that Kudrin is right to be cautious here. Rising delinquency “is a serious problem, but I don’t share the opinion that a second phase of the crisis is unavoidable,” is Ignatiev's view. Overdue retail loans rose to 4.4 percent as of 1 March from 3.2 percent on 1 September. 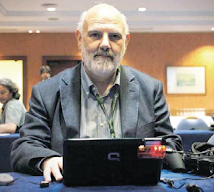 “I believe the most serious phase of the economic crisis is over," Ignatiev told journalists. Would that he were right, unfortunately I think he is wrong, the worst is still ahead. 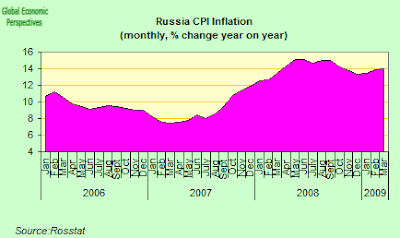 Obviously the continuing inflation is a problem for Russia's central bank since they would obviously like to offer monetary easing to the economy, just as the U.S. Federal Reserve, the European Central Bank and the Bank of England are doing by bringing their benchmark rates close to zero to bolster banks and pull their economies out of recessions. 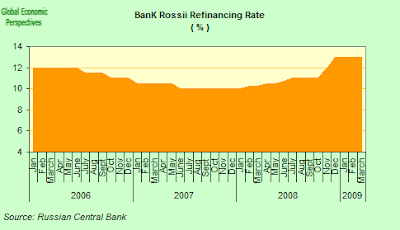 Bank Rossii last cut the refinancing rate in June 2007, and it has now increased the repurchase rate charged on central bank loans four times since November. The refinancing rate, seen as a ceiling for borrowing money and a benchmark for calculating tax payments, is currently at 13 percent after being raised in November and December. The central bank increased the repo rate charged on central bank loans twice in February. Ignatiev admitted that problems with dealing with non-performing loans “could arise", and that he did not "think this is just empty talk,” although he stressed Bank Rossii would seek a solution should the banks be forced to increase reserves to deal with possible losses on loans. Bad loans are still a very low proportion of total debt, nut they are rising. NPLs held by OAO Sberbank, Russia’s largest lender, now make up about 2.8 percent of the bank’s loan portfolio, Chief Executive Officer German Gref last week. Also, on the general economic front the pessimists more or less balance out the optimists. The latest in the pessimist camp, Vladimir Yakunin, head of OAO Russian Railways, said this week that the slowing in the decline of cargo shipments in March doesn’t seem to him to indicate that the country is pulling out of its economic crisis. Railway cargo turnover fell by 15.8 percent in March from a year earlier, compared with a 32 percent fall in January and a 26 percent decline in February. 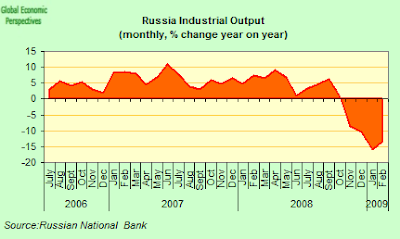 The data is a “leading indicator of the trend in Russian industry,” according to VTB analysts in their GDP indicator. Yakunin said Russian Railways is “fighting” to limit this year’s cargo turnover drop to 19 percent as it is forced to slow down its development amid falling investment. We also learn this week that Siberian Services, an oil-drilling company among whose clients are to be found OAO Rosneft, has defaulted on $100 million of bonds, thus becoming the first Russian borrower to fail to repay its foreign debt this year. Siberian Services didn’t redeem the 13.75 percent notes due 2010 by an April 3 deadline after bond holders exercised a so- called put option, according to Bloomberg news, citing some of the investors involved. State-owned Finance Leasing skipped an interest payment on $250 million of securities in December, according to Bloomberg. Russian borrowers are struggling to refinance about $100 billion in foreign notes maturing this year as banks reduce lending following $1.3 trillion of losses and writedowns since the start of 2007. While the Organization for Economic Cooperation and Development and the World Bank are forecasting that the Russian economy will decline by 5.6 percent and a 4.5 percent, respectively, in 2009, the Russian government is still stubbornly holding fast to its official forecast of a 2.2 percent fall. Publicly government officials are sticking to their view, and diiging in around the idea that they expect a recovery in the final quarter. Deputy Economic Development Minister Klepach said that the government forecast takes into account a package of anti-crisis measures currently being debated by lawmakers that should bolster domestic demand and help boost GDP. Without it, the economy could contract by 4 percent to 5 percent, Klepach noted. The Central Bank, on the other hand, continues to forecast a 4.5 percent contraction for the current year. The Russian Cabinet approved last month a revised budget containing the first deficit in 10 years. The budget anticipates a deficit of 7.4 percent of projected gross domestic product, but since the current forecast is for a GDP contraction of only 2.2%, the final deficit may be considerably larger. The Finance Ministry is now transfering money from the Reserve Fund to cover the deficit, and anticipates using some 2.7 trillion rubles this year to help fund the budget gap. The Ministry of Finance has released the main parameters of its revised federal budget for 2009 which is based on lower oil prices (USD 41 a barrel, Urals) and a drop in budget revenues from the original 21.2 percent of GDP (under the old assumption of USD 95 a barrel) to 16.6 percent, or RUB 6.72 trillion. At the same time, expenditures will be increased by RUB 667.3 billion to RUB 9.69 trillion, to produce a deficit of RUB 2.98 trillion (about 7.4 percent of GDP), a massive reversal of the fiscal position from the 4.1 percent surplus in 2008. The total consolidated general government deficit is expected to be around 8 percent in 2009 deficit and will be financed largely from the Reserve Fund (7 percent of GDP) with modest domestic borrowing (up to 1 percent of GDP). With a large fiscal deficit, however, and the need to preserve some reserve fund resources for the uncertainty likely to extend into 2010, the space for more fiscal stimulus this year appears limited. So the level of the contraction which the Russian economy undergoes in 2009 really is rather big beer, since it will condition the size of the eventual fiscal deficit, and the percentage of the Reserve Fund which will need to be used this year. If there is no rebound in oil prices in 2010 then Russia's position can complicate on a number of fronts, since the Central Bank Reserves will be significantly depleted, the Reserve fund also, and there may be less room for fiscal easing in the face of potential credit rating downgrades, while monetary easing may also prove difficult given the need to support the currency, and protect Central Bank Reserves. Which brings is back to that “second wave” of crisis that Finance Minister Alexei Kudrin said may hit as bad loans eat up capital. Russian overdue bank loans are increasing by 20 percent a month, according to OAO Sberbank Chief Executive Officer German Gref this week. He also stated that about 3.7 percent of Russian bank loans are currently delinquent, a figure which compares with the 40 percent level hit at the peak of the 1998 crisis. The IMF are already predicting a 10% loan default rate, but at this pace we will hit that level in the autumn, while the 40% rate looms in the spring of 2010, unless there is significant upward movement in oil prices. In fact a Bloomberg survey of 17 bank analysts this week gave a mean estimate that Russian bank bad loans will quadruple to $70 billion this year, with non-performing loans rising to 12.8 percent of the 18.4 trillion rubles ($549 billion) owed by Russian companies and individuals. HSBC Holdings Plc, Europe’s biggest bank, expects delinquencies to reach 23 percent, Europe’s highest rate after Hungary at 25 percent. All in all then, 2010 could be a very hard year for Russia and its citizens. Russian manufacturing contracted at the slowest pace for five months in March as companies reduced their stocks of unsold goods and the decline in new business eased, according to the latest PMI report from VTB Capital. The VTB Purchasing Managers’ Index was at 42 last month after a 40.6 reading in February. A figure below 50 means a contraction and above 50 implies growth. Stockpiles of unsold goods fell at the fastest rate since December 2005, according to the survey of 300 purchasing executives. “Stocks of unsold goods declined which, combined with a sluggish contraction of the new business sub-index, suggest that the headline index may keep rising into the second quarter,” Dmitri Fedotkin, a VTB economist, said in the statement. Still, “no sharp recovery” in the index is to be expected. The index showed contraction for the eighth straight month, a longer period of decline than the one registered in 1998, when the government devalued the ruble and defaulted on $40 billion of debt. The manufacturing workforce shed jobs for the 11th month in a row, the longest period of contraction in the survey’s history, VTB said. “Firms reported that the redundancies resulted from lower workloads and the subsequent need to cut spare capacity,” it said in the statement. OAO Severstal, Russia’s biggest steelmaker, plans to cut as many as 9,500 jobs at its Russian units, Chief Executive Officer Alexei Mordashov said on March 11. The metals industry as a whole could cut as many as 60,000 jobs this year, or 5 percent of the workforce as demand and prices slump, the Industry and trade Ministry said.